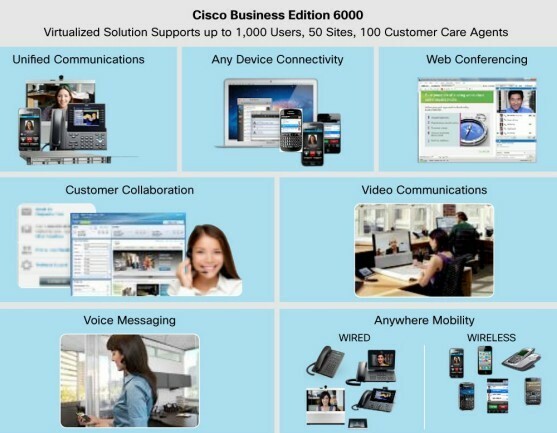 Cisco Business Edition 6000 (Cisco BE6000) solutions gives employees a full range of collaboration tools: premium voice, video, messaging, instant messaging and presence, conferencing, video conferencing, contact center services, mobility capabilities, and more. With these tools your small or midsize business can boost productivity among employees and strengthen relationships with customers and business partners. And they can help you speed decision-making and reduce time-to-market. Cisco BE6000 family is purpose-built for companies with 25 to 1000 employees. The solutions consist of one or more modular, stackable servers so you can easily add more capacity to support additional users. And because they use virtualization technology, they pack a lot of collaboration tools into a small form factor. ● Cisco BE6000 H: Supports nine collaboration application options in a single virtualized server platform; maximum capacity of 1000 users, 2500 devices, and 100 contact center agents. Ideal for medium to large-scale end-to-end collaboration deployments (See Figure 1). ● Cisco BE6000 M: Supports five collaboration application options in a single virtualized server platform; maximum capacity of 1000 users, 1200 devices, and 100 contact center agents. Ideal for medium-scale end-to-end collaboration deployments. ● Cisco BE6000 S: Supports five fixed collaboration applications in a single integrated router/gateway/virtualized blade server platform; maximum capacity of 150 users and 300 devices. Ideal for small-scale “office in a box” collaboration deployments (See Figure 2). The servers are delivered ready for use, with a preinstalled virtualization hypervisor and ten preloaded applications. Specific details of BE6000 platform components are available at the links provided in following section. Cisco BE6000 is a packaged solution that comes preloaded with virtualization and applications software and is preconfigured with core UC applications. Simply turn on additional collaboration applications as your business needs grow. This small-density, integrated router, gateway, and blade server is ideal for small sites that need basic, entry-level voice and IP telephony capabilities, together with powerful, easy-to-use collaboration tools. Maximum number of fixed applications Fixed combination of five applications: Cisco Unified Communications, Cisco Unity Connection, Cisco Instant Messaging and Presence Service, Cisco Paging Server, plus Cisco Prime Collaboration Provisioning (management). Additional Cisco and third-party applications are not supported.